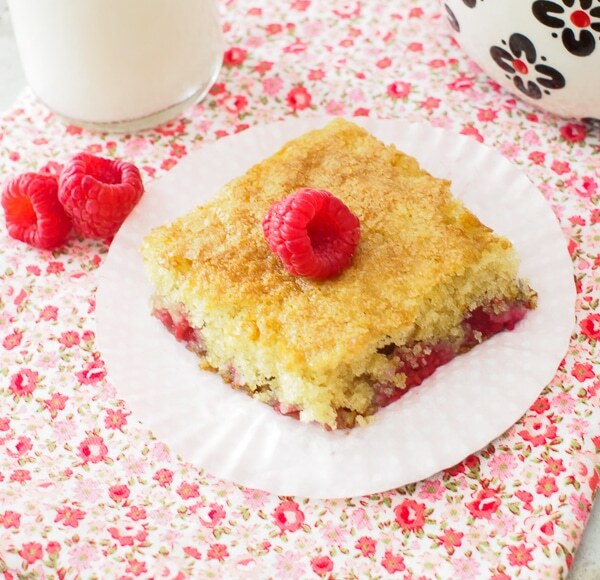 A delicious, moist and light Raspberry Buttermilk Cake perfect for casual entertaining. Raspberries are in season! They are my daughter’s absolute favourite berry and she loves to help me pick them and eat them while still warm from the sun. I couldn’t be happier that she loves them so much since raspberries are a great source of dietary fibre, antioxidants and have anti-inflammatory properties. This simple recipe is from Gourmet and it’s a great cake recipe for using up some extra fresh berries that you may have in your refrigerator. I’ve tried this recipe with blueberries and it’s just as delicious! 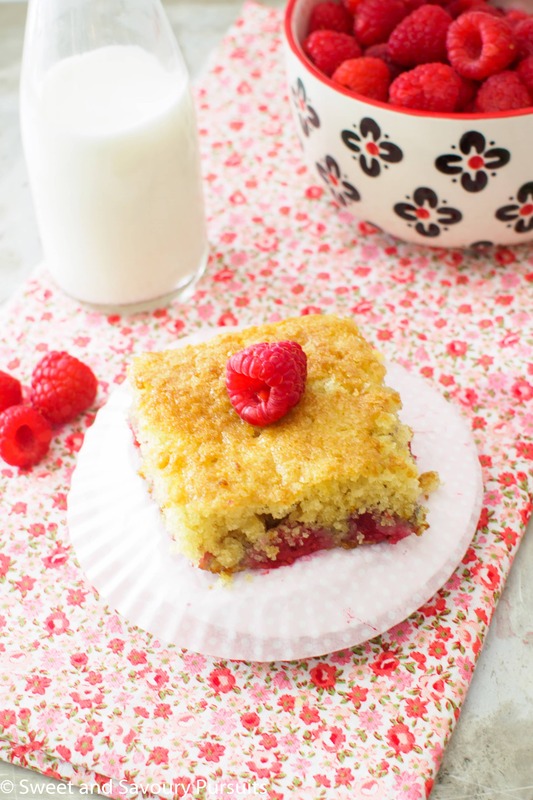 This Raspberry Buttermilk Cake is quick to make, delicious, moist and light, it’s makes a lovely dessert for casual occasions. The only drawback is that the raspberries tend to sink to the bottom, so if you have any tricks to keep that from happening you might want to give it a try. Grease the bottom and sides of a 9-inch pan, I used a square pan but you can use a circular one. Rinse the raspberries and set aside on paper towels to dry. Add egg, lemon zest and vanilla, beat until combined. With the mixer on low-speed, add the flour mixture in 3 batches, alternating with buttermilk, starting and ending with the flour, and mixing until just combined. Spread the batter evenly into the pan and arrange the raspberries on top of the cake. Sprinkle the cake with remaining tablespoon of sugar. Bake for approximately 18 to 22 minutes, until the top is golden brown and a toothpick inserted in the cake comes out clean. Remove the cake from the oven, let it cool for 10 minutes and then invert the cake onto a rack to cool completely. Wait 15 minutes more and then invert cake back onto a plate. So do I. Thank you so much! Buttermilk cakes seem to be a hit with everyone. I think they bring back a lot of childhood memories. I’ve never had one with raspberries–looks good! Supposedly, if you dust berries or chocolate chips with flour they won’t sink to the bottom of cakes. I’ve tried it, but it still didn’t work! Maybe I didn’t use enough flour? Anyway, I kind of like the layered effect sinking fruit gives! Thank you for sharing with See Ya in the Gumbo. Your cake was one of the Top-viewed links and will be featured when tonight’s party goes live! Looks delightful. I love buttermilk cakes! I love it when raspberries are in season. I just can’t get enough. This cake looks amazing! I know what you mean! Thanks! The cake looks extremely delicious! Thank you so much Prudy! Let me know how you like the cake and by the way is just as good if not better with blueberries! I love buttermilk cakes. Sometimes I use blueberries and strawberries! Yes, any berry will do with this recipe, that’s one of the reasons why I love it so much. 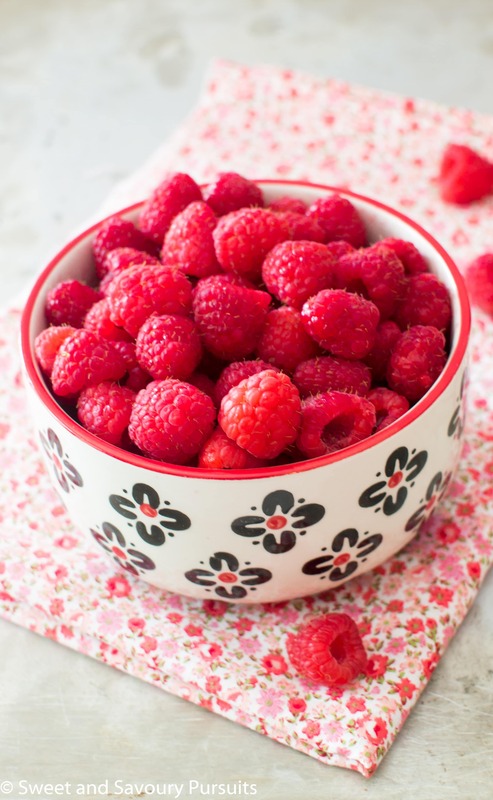 What a perfect way to show case perfect summer raspberries! Terrific recipe. We’re getting a quart or so of raspberries a day from our little patch here in Madison. There are fantastic and I’m trying them with this recipe. Thank! This cake looks so yummy, and I love your photos! What a lovely cake and such a scrumptious recipe! Yum! Wow… It looks so yummm.. Thanks! Ah yes, you have to be quicker than the birds, not an easy task, they love the berries as much as we do! Thank you! I think I’m bringing this one to Fiesta Friday, it’s so good!